There are the books you love. There are the books you hate. There are books that are light, fluffy summer reads. There are the books that make you think. And then there are the books that absolutely break you. I just finished one such book: The Boy Most Likely To by Huntley Fitzpatrick. It seems harmless enough--a contemporary romance about two strong-willed personalities. It seemed fairly lighthearted. What could possibly go wrong? - well, not date her little brother’s baggage-burdened best friend, for starters. 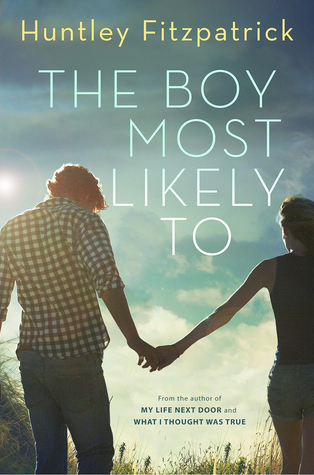 The Boy Most Likely To is a sequel spin-off to My Life Next Door (which I would recommend reading first). This book focuses on two side characters from the first book, Tim and Alice. Because both of them have more intense backgrounds, I knew this book would be a little bit deeper and more angsty than its predecessor--I just had no idea how much. This book focused on Tim, a recovering alcoholic, and Alice, the oldest of eight-soon-to-be-nine children who's just trying to keep her household together. Both of them are struggling (but are too stubborn to admit it). Both of them need each other (but are too stubborn to admit it). As Tim tries to get back on his feet without relapsing, Alice is trying to deal with dead owls in the freezer and her dad's medical bills. Their worlds collide when Tim moves into Alice's family's garage apartment, and as the synopsis says, they do crash hard... but at the same time, it's beautiful to watch. Everything about this book was perfect. I adored Tim, I adored Alice. They felt so real to me, and I wanted to give them both hugs and tell them it was going to be okay. Over the course of the story, I fell so in love with the characters--every single one. Tim Mason, though? He's my absolute favorite fictional character I've read in a very long time. He learned to love again in this book. He had his heart broken in this book. He became my favorite in this book. Despite everything, he learned to be okay again in this book. Not only were the characters perfect, but the story drew me in. It had plenty of twists and turns to keep me guessing and hoping everything would turn out okay. The writing was beautiful--easy to read but poignant when it needed to be (and yet funny and witty too!). Thanks to the writing style of first person present tense, I felt like the story was playing out in front of me. But I have to give credit to the novel as a whole--it's a well-written story through and through. The writing, the plot, and the characters all combined beautifully and made me feel like this was a real story about real people. It made me emotionally invested, it entertained me, and it made me care. And when it was over, I bawled like a baby. And I'm absolutely okay with that. Have you read The Boy Most Likely To or its predecessor? What books have broken your heart lately?